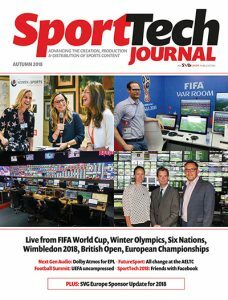 Sports Video Group Europe is very pleased to unveil our Autumn 2018 SportTech Journal, now available as a Digital Edition. The goal of the Journal is to advance the creation, production and distribution of sports content. Printed copies will also be available at the Sport Production Summit in the DeLaMar Theater in Amsterdam on Thursday 13 September. This year the Journal features live reports from the FIFA World Cup in Russia, Winter Olympics in PyeongChang, European Championships in Berlin and Glasgow, British Open at Carnoustie, Six Nations Rugby in Dublin, Wimbledon Tennis Championships and World Snooker 2018 in Sheffield. It also includes event reports from Next Generation Audio Summit, FutureSport at The Kia Oval, our first Nordic Summit in Bergen, Football Production Summit in Paris, Sky Deutschland Summit in Munich, the inaugural Women in Sports Media Initiative networking evening that took place at Langan’s Brasserie in London, Sky Italia Innovation Day in Milan and SportTech 2018: Where Broadband Meets Broadcast at Chelsea Football Club. In addition the 2018 Journal features a guide to the latest innovations and key sports partnerships from over 110 SVG Europe sponsors across Platinum, Gold and OB/SI categories. To view the Autumn 2018 SportTech Journal click here.